Kensington Gardens is a Royal Park with an area of 111 hectares. It was at one time a part of Hyde Park which was land expropriated by King Henry VIII from Westminster Abbey for hunting deer. At the end of the 17th century King William III decided to relocate to Kensington Palace and closed off this part of Hyde Park for use as private gardens. King George II in the 1720s reopened Kensington Gardens to the public on Saturdays but only to those wearing formal dress. Kensington Gardens is continuous with Hyde Park to the east but unlike Hyde Park, Kensington Gardens closes at dusk. The park is popular with runners and joggers. 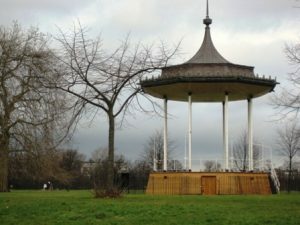 The Diana Princess of Wales’s Memorial Playground, which is intended for older children, is located in the northwest corner of the gardens and contains a large pirate ship in a huge sand pit and a tree-house. Next to the Memorial Playground is the Elfin Oak which is a 900 year old tree stump carved and painted so that it appears that elves gnomes and small animals are living in its bark. The 1969 album Umagumma by Pink Floyd has a picture of Dave Gilmour standing in front of the Elfin Oak on its inside cover. The Italian Garden is at the north west end of the Long Water where the River Westbourne used to enter the park. The garden has four fountains and a number of classical sculptures. The Westbourne was dammed to form the Long Water by garden designer Charles Bridgeman for Queen Caroline(wife of King George II). They made landscape history by separating Kensington Gardens from Hyde Park by a low wall and ditch rather than a fence. This had the effect of preserving long views across the parkland which a fence would have blocked. The ditch became known as a “ha ha” – said to be the involuntary exclamation of surprise uttered by disappointed pedestrians who found it blocking their path – and the design was subsequently copied across the country. The park was the inspiration of, and is the setting for the book Peter Pan and there is a statue of this fictional character next to the Long Water in the north east of the park. The Serpentine Gallery is located to the southwest of the Long Water and hosts exhibitions of contemporary art in the summer months with 2 month rolling exhibitions. Every year a different architect is commissioned to build a summer pavilion next to the gallery. The gallery is open every day and admission is free. This year (2012) the Serpentine Gallery will open its new space, the Serpentine Sackler Gallery located in a nearby former gunpowder depot called The Magazine. The programme of the new gallery will include an annual large-scale light installation inside the building and an outdoor Playscape for children and adults of all ages. Like the Serpentine Gallery, it will be open every day and free of charge. The Serpentine Gallery is open from 10:00 to 18:00 every day but is closed between exhibitions and is free of charge. The Albert Memorial by Gilbert Scott is in the south part of the gardens. This is a Gothic memorial in marble and gold leaf to Prince Albert, husband to Queen Victoria. In the centre of the memorial is Albert holding a catalogue for the 1851 Great Exhibition which he organised. The Albert Memorial was erected in 1876 and is covered with 169 portraits of painters, poets and architects. Its corners illustrate the continents of Asia, America, Europe and Africa and figures represent Albert’s interests in the arts, industry and science. Kensington Palace to the west of Kensington Gardens is open every day from March to October. This Jacobean mansion was extended by Sir Christopher Wren when King William III relocated to Kensington Palace. Queen Victoria was born in Kensington Palace and it remained her home until her accession to the throne in 1837 when she chose to make Buckingham Palace her official residence.